Home » What are The Effects of Hyaluronic Acid On The Skin? What are The Effects of Hyaluronic Acid On The Skin? Hyaluronic acid is widely distributed in connective tissue, epithelial tissue and nerve tissue. It is a transparent colloidal substance with strong moisturizing function. It is the best moisturizing factor for skin. With the aging of the human body, the hyaluronic acid in the body will gradually lose, resulting in the loss of the skin’s water storage capacity, shriveling, aging, depression and wrinkles. Hyaluronic acid can increase and maintain the moisture content of the skin, let the skin present its due elasticity and luster, can achieve long-term moisture retention, and retain the moisture of the skin. Therefore, hyaluronic acid naturally becomes a necessary moisturizing substance in cosmetics. Generally 5% of the hyaluronic acid shape will become jelly like, in practice, adding 0.5% of the amount is already high. In fact, the most basic and important functions of skin care products are two: sunscreen and moisturizing. For normal skin, as long as sunscreen and moisturizing are guaranteed, the skin will naturally return to its normal state of health. How can hyaluronic acid be applied to the skin surface? 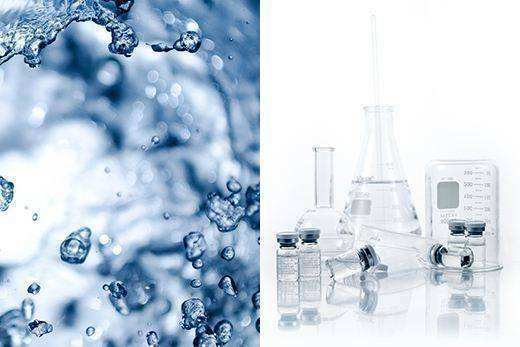 1, the skin can absorb some moisture from the hyaluronic acid solution, the moisture content of the stratum corneum will increase, that is, it plays a role of replenishing water. 2, slow down the loss of skin moisture, played a moisturizing effect. Is it possible to use only hyaluronic acid? Although hyaluronic acid is good in absorbing water, it does not mean that the water it absorbs will not disperse again. When the surrounding environment is very dry, the moisture in hyaluronic acid will also disappear. So when applying hyaluronic acid products, we should remember to use the lotion and lock the skin moisture. How to use hyaluronic acid correctly? Before using, using a lot of moisturizing water on the face, because it will absorb water in a short time, if the skin is drier, can also be smeared with hyaluronic acid after applying a layer of moisturizing water, and then smear emulsion. If there is a phenomenon of rubbing with products containing more hyaluronic acid, you should pat to avoid repeated rubbing. Beauty and luxury lifestyle website by a herbal extracts expert Maria. Follow our articles and read on to discover the best botanical ingredients, hyaluronic acid, vitamins and other organic chemicals for pharmaceutical, nutraceutical, health-food, and cosmetics industries.